Bonjour readers and Happy Chinese New Year! Today I was lucky enough to drink a wine almost as old as me. 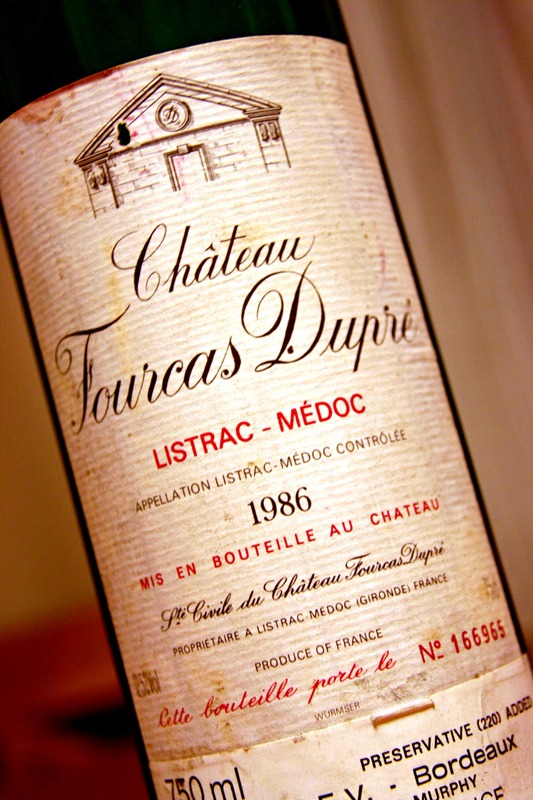 A 1986 Listrac-Medoc. That’s pretty old! This guy comes from a red wine appellation from the Haut Medoc region in Bordeaux, meaning Cabernet Sauvignon (especially in Listrac-Medoc) but also the usual Merlot, Cab Franc, Malbec and Petit Verdot. The area is situation on limestone and clay (rather than the more prestigious areas on gravel and clay) weighting in at 12.5% alc. Lets see how it goes! Nose is thin, strawberries and sour cherries with a blood plum background. There is also mushrooms and some cantelope meringues. I know hey. It’s very light and whispy and doesn’t engage you but you notice it. The attack is light, ripe slightly mushy strawberries comes to the front. It transistions into an initially bitter mid palate but immediatey the acidity and sweetnes come in to balance it out, like the flavours of strawberries dipped in dark chocolate flakes. Finishes long and warm and you can still get the alcohol. Little furry and grainy (dusty throat feeling). It’s an ok wine, nothing especially awsome but it is elegant and has a finess to it after all this time in the bottle. Definatly more merlot in this but still Cabernet.